Lloyd Borrett doing deco above the USS Arkansas battleship at Bikini Atoll. Photo: Bill Jakab. There's no denying that peak performance buoyancy control separates the dive paddlers from the pros. When all the big talk is over and the water closes over your head, there is nothing that pulls the whole scuba diving thing together like perfect buoyancy control. The secret to pinpoint buoyancy control begins with fine-tuning your weighting — that's how much lead you thread on your weight belt, or put into your weight pouches. If you are carrying just the right amount of weight, you will have the smallest amount of BC inflation. That means less drag and more efficient finning. Less BC inflation also means less buoyancy shift with depth, so you'll make fewer adjustments. There are many tricks, but pinpoint buoyancy control is the fundamental skill. Precise control of your buoyancy is what enables you to hover completely motionless and fin through the water, at any depth, without using your hands at all. It sounds easy, so why isn't it? In fact, perfect buoyancy control requires getting more than one thing right. The factors that affect your buoyancy besides ballast weight are BC inflation, your trim, exposure suit, depth and breath control. Your ballast weight and your trim are the only two factors that, once you've selected them, stay put. All the others are variables, changing during the dive along with time or depth or both. Some you can control, some you can't. We want to go down, but the inherent buoyancy in our wetsuits, our BCs, our lungs and our fat cells are all conspiring to keep that from happening. To overcome the force of buoyancy you have to counterbalance it with ballast weight. The question is, how much? While the answer is different for every diver, the goal is the same: carry enough weight to enable you to function efficiently and safely at all depths, and not a gram more. Divers are generally taught to define this as being neutrally buoyant at 5 metres (15 feet) deep while wearing an empty BC and carrying a nearly empty cylinder. But how do you get there? There's the crude, ballpark method: Carry 10 percent of your body weight in lead if using a 5 mm wetsuit. Slightly more refined is the Surface Check or Pre-Dive Weight Check float method — in full scuba gear. You can do this easily at the start of a dive, even with a new equipment configuration. Load enough weight to enable you to float with the water at eye level (some would say at the hairline). A relaxed diver with a full tank and an empty BC should sink gently while breathing through the regulator. That's right, you should be slightly negative even on a normal inhale. That's a little heavier than you might have been taught. The rule you often hear — that you should float at eye level — is about right for the end of your dive, when you will weigh two kilograms less. (Most of that loss is the weight of the breathing gas you will use up.) So you need about 2 kg of extra lead at the beginning of the dive. Most recreational divers set themselves up to descend fast when they dump their BCD air on the surface. That means they're over weighted. If you're properly weighted, you'll probably need to do a duck dive to descend from the surface. Breathe out, duck dive, breathe again at one metre or more below the surface. Your buoyancy will be spot on if with NO air in your BCD, and just 50 bar of air in your cylinder, you are neutrally buoyant at the minimum depth you want to be able to hold. For an open water diver the minimum depth you want to be able to hold might be 5 metres (15 feet) deep. For a pier dive you might want to make it 1 metre (3.3 feet) deep. This weight check can be easily done at the end of any dive. If you still have more than 50 bar in your tank, simply use your Octopus second stage regulator to drain your cylinder down to 50 bar. Get yourself calm and breathing normally. Concentrate on relaxing and being still as any sculling with hands or feet will propel you upward. Then dump the air in your BCD. You should rise slowly as you inhale, sink slowly as you exhale. If you start descending regardless, you're over weighted. If you start ascending, you may need more ballast weight. But make sure your BCD is really empty? Almost every BC traps some air despite your best efforts to dump it. Next time you dive, feel behind your head. If the top of your BC has formed a 'pillow', it has trapped some air. It may amount to several pounds of buoyancy. To deflate that pillow, lean back as though you were relaxing in a recliner and hold your oral inflate/deflate device toward the surface. Most BCs will then vent that last bit of air. At this point your dive buddy could help you to add or take off lead to get you perfectly neutrally buoyant. This process is often best done on a shore/pier dive. When you see a technical diver fully kitted up at a pier, the chances are they're doing a dive with new equipment and they want to practice drills and get their buoyancy dialed in right with the new dive gear configuration. If you are neutral at the minimum depth you want to be able to hold (e.g. 1 metre) at the end of your dive, you will probably be slightly positive at the surface. How positive will depend on how much neoprene you wear. We recommend getting your weighting right to the nearest 0.5 kg (1 lb). After each dive, write down what exposure suit you wore, what equipment you used, how much lead you carried, how much your body weighs and whether you seemed too heavy or light at your safety stop. Keep logging this information until you get your weighting correct. Then, even if it's six months later and you've gained a few kilograms, you should be able to estimate almost exactly how much lead you'll need. Got your weighting exactly right on the first day of your vacation? Great. Now check it again a few days later. Chances are you can drop a couple more kilograms. Why? You're more relaxed now, so you're breathing with less air in your lungs. We think it helps to understand the factors involved rather than just blindly piling on or taking off the lead. So why not break it down to find out why you need to carry the weight you do, and what specifically you are counterbalancing. By deconstructing your buoyancy status, you know exactly where your counterweight needs are greatest, and that might reveal ways to reduce the amount of weight you ultimately have to carry. Here's how. Tip for Shaving Ballast Weight: Lose weight. Also, work to turn your fat to muscle. Fat mass is a lot more buoyant than muscle mass, so any fat you can convert to muscle will lower your buoyancy deficit. Wearing your exposure suit, get into the water and repeat the procedure outlined in Step 1. Then take the total amount of weight required to get neutral, subtract Step 1's total, and you'll have the net buoyancy budget for your exposure suit. Tip for Shaving Ballast Weight: If water conditions permit, cut down on the thickness of your wetsuit. A wetsuit can have one to two kilograms of buoyancy for every millimetre of thickness. If you wear a neoprene drysuit, consider that compressed or crushed neoprene suits have much less buoyancy than standard neoprene. If you wear a fabric drysuit, remember that thinner undergarments have much less buoyancy than the puffy stuff. BCDs can be a huge source of inherent buoyancy, especially the older, full-featured models that have lots of traditional-style padding. It used to be common for BCs to carry upwards of two kilograms plus of inherent buoyancy, which means, of course, that you need two kilograms plus of extra lead on your weight belt to compensate for it. Fortunately, most modern BCs carry much less inherent buoyancy. To test your BCD's inherent buoyancy, submerge it while venting all exhaust valves to bleed air from the bladder. Knead the padding in the shoulders and backpad and behind the pockets to release air bubbles. Slowly rotate the BC to enable any trapped air to escape. Be patient, allow plenty of time for water to displace the air in the material. When you stop seeing bubbles, release the BC into the water column. If it heads to the surface you've got some inherent buoyancy to deal with. Add weights until the BC will hang neutrally buoyant in the water. Then count up how many weights it took to get there and you'll have your number. Tip for Shaving Ballast Weight: Buy a modern BC. Models that have come onto the market within the last three or four years carry, on average, from a half to one kilogram of inherent buoyancy, and some carry none at all. Note: Most manufacturers don't provide the inherent buoyancy of their BCs. The buoyancy characteristics of cylinders vary widely. For example, a standard Catalina S80 aluminium tank weighs 14.3 kg (31.6 lb) empty. It is 0.8 kg (1.7 lb) negatively buoyant when full, and 1.2 kg (2.7 lb) positively buoyant at 35 bar (500 psi). That's a two kilogram buoyancy differential between the beginning of a dive and the end of a dive. Of course, this needs to be dealt with by adding extra ballast weight. A steel cylinder, on the other hand, tends to start off negatively buoyant and stay that way. For example, a 232 bar 12.2 litre Faber tank weighs 12.9 kb (28.4 lb) empty. (Yes, the steel cylinder weighs LESS than the aluminium cylinder because the walls of the aluminium cylinder have to be thicker.) This steel cylinder is about 4.25 kg (9.4 lb) negative when full and 0.75 kg (1.7 lb) negative when empty. That's a 3.5 kg buoyancy differential between the beginning of a dive and the end of a dive. But it's two kilograms of lead you won't need compared to using the aluminium S80 cylinder. Tip for Shaving Ballast Weight: Switch from an aluminium cylinder to a steel cylinder. 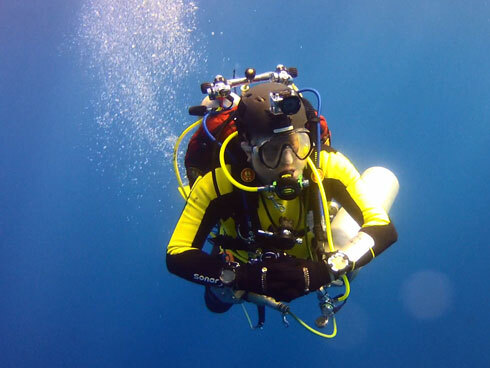 A properly-weighted diver who goes from an aluminium S80 to, say, a steel 12.2 litre cylinder can usually take two kilograms off their weight belt. Gather your regulators, gauges, knife, fins and any other items you regularly dive with, place them in a neutrally buoyancy mesh bag, and submerge it. The goal here is primarily to see if the total package is positively buoyant. If it is, add some weight until it becomes neutral. If it's negative it probably won't be by much, so consider it a ballast slush fund. It's not working against you, and that's all that matters. Add it all up. This should be very close to your target ballast weight requirements, and it should also give you a clear picture of where your biggest buoyancy challenges lie. To double-check your calculations, gear up with all the components you measured separately, get back into the water and repeat Step 1. If the above scenario played out like it's supposed to, you should be floating at eye or forehead level in a relaxed position. When you exhale you should start to slowly sink. If not, you couldn't be more than a pound or so off your target. Make the final adjustment and go diving. If most of your diving is done in fresh water springs or lakes, then ballast calculations should be done in fresh water. If you dive mostly in the ocean, then do the calculations in salt water. If you switch back and forth, you'll need to adjust your ballast needs as you go. Be prepared to add anywhere from two to three kilograms when going from fresh to salt water diving. Is 'Perfect' Weighting Always Perfect? Because excellent buoyancy control and minimum weighting are the hallmarks of an expert diver, many of us feel pressure to eliminate every pound of lead we can. But sometimes that's a bad idea. When you're wearing little or no neoprene, there's little or no buoyancy change with depth. You can therefore minimise your weighting without risking too much positive buoyancy when you ascend. But wearing more neoprene means more changes in buoyancy as it compresses. At depth, you'll probably have to inflate your BC to compensate for it so you lose a good deal of the streamlining benefit. As you ascend, you'll have to vent that air accurately to avoid positive buoyancy. Here, an extra kilogram of lead will give you a margin for error. Other reasons to be a kilogram or so heavy: inexperience judging your depth and controlling your buoyancy, darkness or low visibility that reduce visual cues of an ascent, task loading, and heavy surge that can pop you to the surface from your safety stop. Think of minimum weighting as you would the edge of a cliff. You don't want to fall over into positive buoyancy and an uncontrollable ascent. When in doubt, it's safer to stay a few steps back from the edge. See also our Dive Weights Buying Guide.